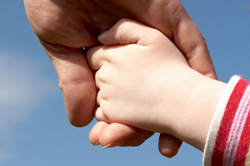 A public agency adoption is sometime referred to as a foster care adoption. These adoptions often involve children who are older, children who are part of a sibling group that must be adopted together, or children that have additional needs. Most of the children who are in foster care will return to their biological families and will never become eligible for adoption, but there are still many children who are currently awaiting placement with a permanent family. As the name suggests, public agency adoptions are facilitated by local public agencies, including the Montgomery County Department of Health and Human Services (DHHS), Virginia Department of Social Services or the D.C. Child and Family Services Agency. In addition to working with a public agency for the matching and support services you need, every foster-adoptive parent also needs to work with an attorney to complete the legal process of their adoption from foster care. Jennifer and Catelyn have helped many people become parents by adopting from foster care in Maryland, Virginia and Washington, D.C.
To learn how to adopt a child from foster care, contact us now. When Does a Child Become Eligible for Adoption through Foster Care? A child may be removed from his or her home due to allegations of abuse or neglect. The child will then be placed into a foster care home. If the situation is not resolved and the child is unable to be reunited with his or her family, the public agency will initiate court proceedings to terminate the parents' legal rights. Sometimes, the public agency will request that the adoptive parents address the parental rights when they pursue the adoption. If the public agency obtains guardianship, the child will frequently be placed for foster care adoption with the foster parents who have cared for him or her during the placement. However, the child may also be adopted by a relative, such as a grandmother or aunt, or another approved foster family. The adoption proceeds by filing the Petition for Adoption and navigating the court system until the adoption is finalized, similar to a private agency adoption. The case goal of about 55 percent of children currently in foster care is to be reunited with their family, and it’s unlikely that they’ll become eligible for adoption from foster care. However, for about 25 percent of children in foster care, their goal is to be permanently adopted. Many of these children are older, part of a sibling group that must be adopted together, or have additional needs. Learn more about foster care adoption in MD here. Learn more about foster care adoption in VA here. Learn more about foster care adoption in Washington, D.C. here. How We Can Help with Your Foster Care Adoption in Maryland, Virginia or D.C.
Our law offices handle agency finalization in public agency adoptions in Maryland, Virginia and the District of Columbia. While we have handled cases involving the termination of parental rights in public agency placements, we strongly encourage that the adoptive parents require the public agency to terminate the biological parents' rights prior to filing a Petition for Adoption. Otherwise, as the adoptive parents, you may be responsible for the legal fees associated with the termination of the biological parents’ rights, which can be costly. The adoption of children who have been placed in foster care in Maryland, D.C. and Virginia is conducted as an agency adoption. In those cases, the county department of social services acts in its capacity as a public child placing agency. The public agency works to terminate the parental rights of the biological parents. The agency may then place the child for adoption with an existing foster family or another family selected to adopt the child. If you’re unsure of which type of adoption is right for your family, we can walk you through the various adoption processes to help you find your desired path. Contact us now to learn more about public agency adoption if you’re interested in a foster care adoption in DC, MD or VA. The adoption of children who have been placed in foster care in Maryland is conducted as an agency adoption. In those cases, the county department of social services acts in its capacity as a public child placing agency. The public agency works to terminate the parental rights of the biological parents. The agency may then place the child for adoption with an existing foster family or another family selected to adopt the child.